With VideoWebWizard 2.0, you can add video on your website in 10 minutes. 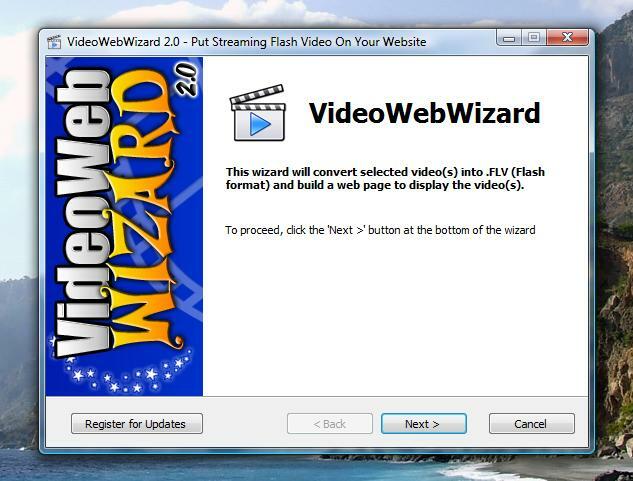 VideoWebWizard converts your videos to Flash format, which is viewable on virtually all computers. The software will convert your video (AVI, MP4, MPG, MOV, VOB, or WMV formats) into Flash FLV format. Multiple video conversion is supported. The software thens puts your video inside one of the 14 different players included and places it on a new (or existing) web page. the result to your website and you're done! - OR Simply Use One Of The Easy Presets Such As "Cable" Or "Dial-Up"! Qweas is providing links to VideoWebWizard 2.0 as a courtesy, and makes no representations regarding VideoWebWizard or any other applications or any information related thereto. Any questions, complaints or claims regarding this application VideoWebWizard 2.0 must be directed to the appropriate software vendor. You may click the publisher link of VideoWebWizard on the top of this page to get more details about the vendor.